Did you know the trick to generating messages or a message thread rather than actually sending them? You would have come across these kinds of messages in Social Media platforms and wondered as to how they are made. The secret is to create images that look like screenshots of texts using various fake message tools. And the best part is that these are totally free to use! Such tools are in plenty for generating fake texts in Android phones. However, you’d have come across a lesser number of iPhone text generators. 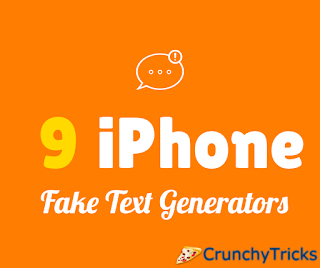 In this post, you can explore 9 such fake text message tools available for generating iOS texts. Generating fake messages can help you in many places. In today’s world where social media is soaring with its popularity and reach, these fake text generator tools can be used to create your own pranks and memes and you can show them with your friends. Since fake text generators are built primarily with this intention, most of them have options to directly share the fake message you just created on Facebook, Twitter or Pinterest. On a serious note, you can also use these tools to show the prototype model of some presentation that is a part of your work. This is probably the best fake text generator tool with all possible customization that you want in creating a fake iPhone text. This tool gives a lot of importance to attention to detail. With options even to change the minute features in a text, this tool helps you in creating a ‘real’ fake message. You can also add images in the text. 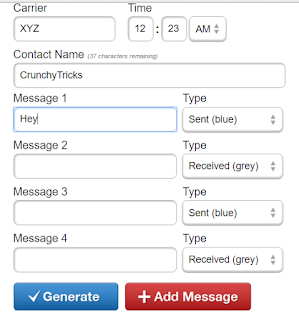 This tool gives a variety of features that you want in a text message generator. All the features are shown at left side of the screen. 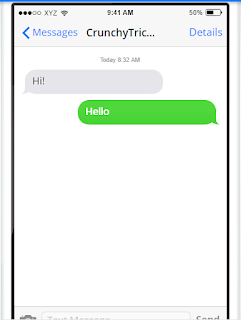 Choosing the Type of message iOS7 or iOS8 messages can be generated. Using the toggle button, select the interface of your preference. 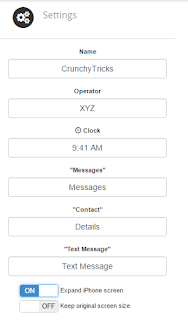 Then, change all the details of the message such as Sender’s name, Operator name, Time and the other fields as shown in the image using Settings. Expanded screen size can be used if the screenshot you are making is quite long. For this, use the Expand iPhone screen option. Similarly, choose the details regarding the Battery icon and Connection. Battery percentage, Signal strength, etc can be adjusted. 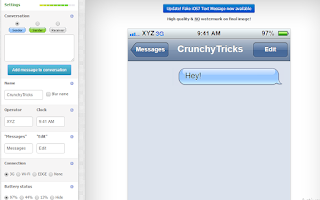 You can toggle the buttons below the Messages option to change the color of the text message. Grey color is used to indicate the messages sent by the owner of the phone and blue or green color indicates the person at the other end. Type the message you want in the field given. You can insert emojis also. If you wish, you can upload images too! When you hover the mouse over the message, a delete icon becomes visible. Click on this to delete the default message and then fill in with your own. To save the image, click on the Download image option. The image will be downloaded in PNG format. When you are done, it would look like as shown in the above image. 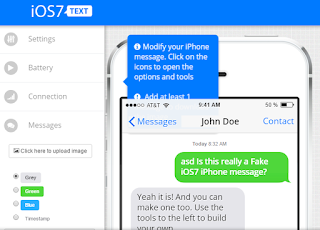 Another tool is iOS7text where you can generate iOS7 messages. The customization is similar to Foxsash. Here you can change the battery percentage, network connection details and other information such as the name of the sender. Once again, text color can be changed to distinguish between the sender and receiver. 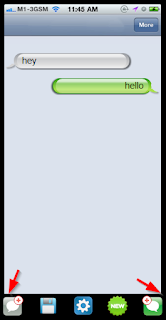 Using iPhoneFakeText, you can generate fake iMessages. The customization available are limited. However, you have options to share the image on Facebook, Twitter, LinkedIn or Pinterest. The text can be made on the options available at the right side and the changes can be seen on the screen at the left side on the go! Send and Receive option can be used to change the sender message and receiver message. There is an option to blur the contact name. The list of service providers is limited to a number of options specified in the drop down menu given. To delete or edit a particular message, simply hover the mouse on that message and the options to delete or edit appear. 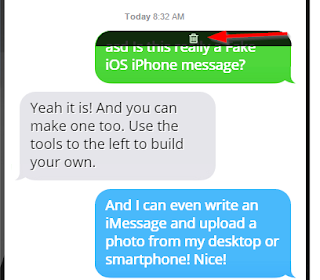 This tool can be used to generate fake texts of the old iOS version. After the screenshot has been generated, you’ve options to share it on Facebook or Twitter or to download the image. Add Message button can be used to add more lines of messages. Fakephonetext is a simple tool to generate fake messages. The options here are fewer. The change of interface is not supported. You can blur the contact name. The battery percentage can be hidden. If you want to show it, then one of the options from the given list can only be chosen. Using this tool, you can generate texts in other languages too apart from English. A few languages supported are German, French, and Dutch. SMS headers can also be included. Altogether 14 languages are supported. iOS7 is the supported interface. iPhone model is 5. 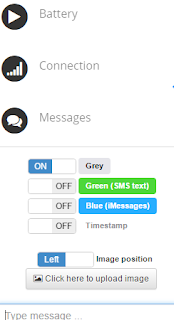 Using the Generate button, SMS can be generated. 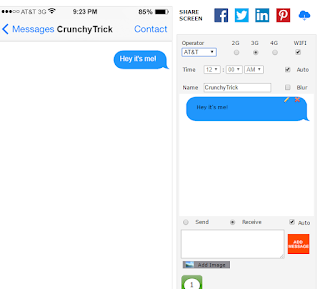 Threads is an iOS app that can generate fake messages. It is a lightweight app that can be of great use to you. Here is how to use Threads. Created in 2015, the app works on an iOS8 or above platform. This app is free and can be downloaded from App Store. Download and install Threads from the App Store. 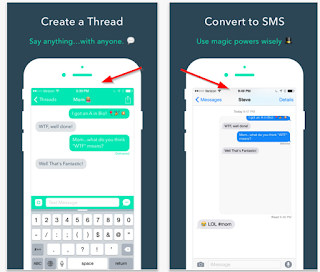 Create the conversation thread and then convert it into SMS. This tool is very simple to use and comes handy in generating a quick fake text. But the options are very limited. Carrier name and time can be changed. 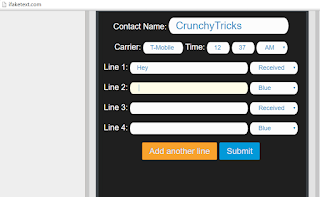 More lines can be added using the Add another line option. This is a very simple and quick tool to generate a fake SMS. The options for customization are few. The speech bubble buttons can be used to create fake messages and replies. It generates the message in the old iOS interface. So be it generating screenshots for some proposed model of your upcoming project or be it simply to prank your friend. Give these fake text generator tools a try! But always keep one thing in mind. These fake text generator tools must not be in any way used to create fake evidence or with the intention of causing anyone any harm. With that, you are good to go!